It’s a small world. Mar-a-Largo was sold to Donald Trump by Fred Korth who was the step-grandfather of Democrat superstar Robert Francis “Beto” O’Rourke. Korth was the co-executor of the estate of Marjorie Merriweather Post, who was his lover and who built Mar-a-Largo. Korth married Charlotte Brooks Williams, O’Rourke’s grandmother, in 1980 after Ms. Post’s death. Korth was a rich Texas banker who served as John F. Kennedy’s Secretary of the Navy until leaving the post on Nov. 1, 1963 under a cloud. Put this in a small world category too: Korth handled the divorce of Edwin A. Edahl in 1948 from Marguerite Frances Claverie Ekdahl. She’s also known as Marguerite Oswald. She was Lee Harvey’s mom. 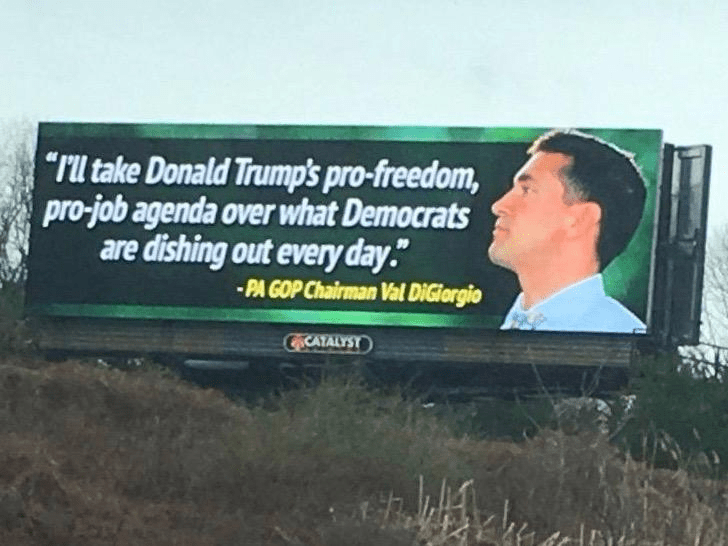 Val DiGiorgio Trump Billboard — We’ve been sent this photo said to be of a billboard in Allegheny County featuring Pennsylvania’s own feckless Republican Party Chairman pandering to Trump voters. We thought you were a Kasich guy, Val. Seriously, how can a lobbyist for Stradley Ronon put the interest of Republican voters first? And really, this billboard does not help, either you or our great president.